You are here: Home » GENRE » Scifi » The Event: The Complete Series (DVD SF TV series review). 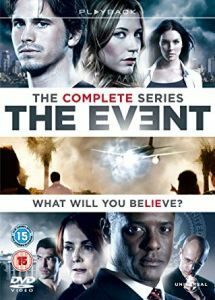 The Event: The Complete Series (DVD SF TV series review). It’s hard to say which ‘Event’ is referred to in the title of his single season series. Back in the early 1950s, an alien spacecraft crashes in the Antarctic. They appear human with a much longer life-span but 93 are injured and captured by the Americans and imprisoned there. What they don’t know is an uninjured two-thirds more were ordered to go and infiltrate and live in human society. 63 years later, a civilian airliner is taken over and about to crash into a presidential party where President Elias Martinex (actor Blair Underwood) is going to have an interview with Sophia, the leader of the captive aliens with a view to releasing them, when it is teleported away. Is that the Event? It’s only in the final episode that we learn that the Event hasn’t happened yet and could spell the doom to the human race. Equally, these aliens originally came from our planet and predate current Homo sapiens. That made me think that perhaps these are the Denovians and it’s a shame that there is not a second season to confirm this. It is pointed out by one of the aliens that they come from NGU528 according to terrestrial mapping of the galaxy. Into this mix we have Sean Walker (actor Jason Ritter) and his girl-friend Leila Buchanan (actress Sarah Roemer) on holiday, when suddenly she not only disappears but it’s made to appear she was never there. Walker is a determined young man and computer expect but has no idea what he’s gotten himself into when people are out to kill him. Should I mention that he was later on the plane that was teleported and that Leila’s father, Michael Buchanan (actor Scott Patterson) was the pilot? In all of this is a conspiracy. Sophia’s son, Thomas (actor Clifton Collins Jr.), does not want to go her peaceful approach and plans to bring more of their people to Earth. He is totally ruthless in achieving his aims which only aggregates Martinez away from his soft approach. The story is seen from several viewpoints. President Martinez goes through a transition of thinking he is too soft to being absolutely ruthless. So, too, does the more passive Sophia McGuire (actress Laura Innes), with the surname revealed in an audio commentary, when she suddenly finds she has to rescue her own people when their sun is due to go nova. We had talking some 2 billion people and to house them all, she will have to exterminate the current human population. The Director Of National Intelligence, Blake Sterling (actor Zeljo Ivanek), is responsible for the imprisonment of the aliens in the Antarctica and is ruthless in his own way. The real one to watch out for, though, is Vice-President Raymond Jarvis (actor Bill Smitrovitch) who gets in way over his head when he thinks he can achieve peace with Sophia after poisoning the President. As the aliens look human, don’t be surprised if they’ve infiltrated various government agencies and the various means they use to hide their unusual blood group. Simon Lee (actor Ian Anthony Dale) is truly astounding and with his own level of ethics. What can I say about the plot without going spoiler? There are some elements that I can criticise. Neither side have wondered why the aliens are human-looking or can interbreed which would have been top of my list. Some reveals are given late in this season and you’ll certainly be wondering whose side you should be rooting for. The conspiracy plot rarely takes the expected turn and what you think is true often isn’t. This is not a series you can watch with any assumptions and no one is a fool, well except the vice-president. The worse criticism is having so many flashbacks in the first four episodes but there is a lot of information to put in to build a picture of what is going on. What makes ‘The Event’ work so well is you expect the story to go one way and then it goes and does the unexpected with the same information. I suspect this is what made it hard to keep its viewers. However, once past this point this is a deeply riveting series. Seen in a boxset and over successive nights, you are really caught up in events and some fine acting performances. You should also note my enthusiasm is over-whelming at this point. This series is very much a cult series that deserves to be seen and I’m surprised I never heard of it in 2011. The worse thing was two audio commentaries from the special effects team who expressed no interest in the acting and so rather than talk there were very long pauses when they didn’t say anything. What they did say didn’t really inform very much. In contrast, the audio commentaries with the producers and cast members were some of the best and totally funny. The extras on the final disk look like some were originally shown as podcasts looking at the special effects and how Jason Ritter tries his hand at everything behind the cameras. Although there is a springboard for the second season, the end of season one is as actress Laura Innes points out a ‘brown spot’ moment. You’re left high and dry but it does have an ending of sorts. One can only hope that the studio will think again and ask let’s see what happened next. After all, what’s 7 years between seasons to these aliens? « Star Citizen game gets a star-studded trailer with …. Squadron 42!